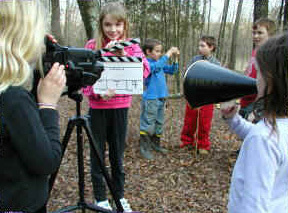 Movie Makers’ summer day camps are like a whole session in one week! Each week 18 young people will participate in the writing, directing, acting and camera work to create their very own movie. Beginning only with the theme for that week (see our 2019 schedule here) we’ll create our story, develop our characters, design sets, even work on costumes and make-up. Then we’ll get a crash course in camera work and filming techniques using digital video equipment. Putting all the skills together, we’ll spend the week making our movie. All participants will spend time in front of and behind the camera, with the opportunity to focus on the parts of movie making they enjoy the most. At the end of each week, we will have made our movie! A few weeks later, we’ll gather for a premiere party where we’ll watch our movie on the big screen. And each participant receives a DVD copy of the movie to keep. Our camps are separated by age. The younger group is for kids 6 – 10 years old. The older group is for young people 11 to 17. Summer camp sessions are themed. That means we know ahead of time what genre we will be working with. Each week-long summer camp costs $400, and includes the week of camp, the premiere party, and a link to a digital copy of the movie. Camp Hours are 9:00 AM – 3:00 PM each day. We offer extended care between 8AM – 5PM for those who need it.